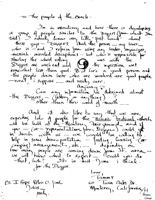 Abstract: A letter from Tammy in Monterey who asks, "Can any information be obtained about the Diggers (history or anything)? other than thru word of mouth .." She knows local Diggers-type group who will put people up during upcoming Monterey music festival. Notes: R.s. 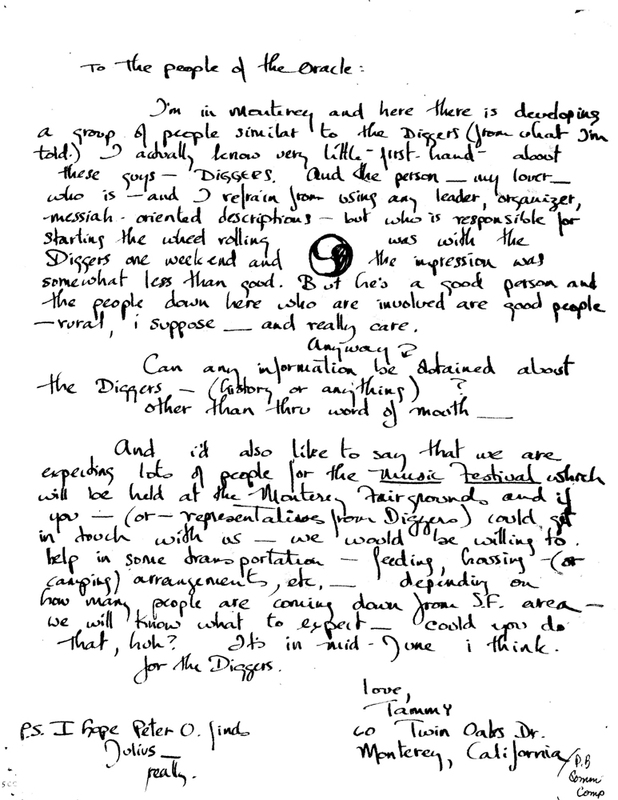 : "There is only 1 digger". I’m in Monterey and here there is developing a group of people similar to the Diggers (from what I’m told.) I actually know very little - first-hand - about these guys -- Diggers. And the person -- my lover -- who is -- and I refrain from using any leader, organizer, messiah-oriented descriptions -- but who is responsible for starting the wheel rolling was with the Diggers one weekend and the impression was somewhat less than good. But he’s a good person and the people down here who are involved are good people -- rural, i suppose -- and really care. And I’d also like to say that we are expecting lots of people for the Music Festival which will be held at the Monterey Fairgrounds and if you -- (or -- representatives from Diggers) could get in touch with us -- we would be willing to help in some transportation -- feeding, housing -- (or camping) arrangements, etc. -- depending on how many people are coming down from S.F. area -- we will know what to expect -- could you do that, huh? It’s in mid-June i think. P.S. I hope Peter O. finds Julius -- really.